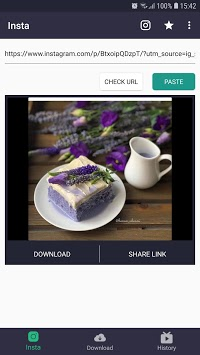 - Downloader for Instagram allows to download videos and images from INSTAGRAM's links. 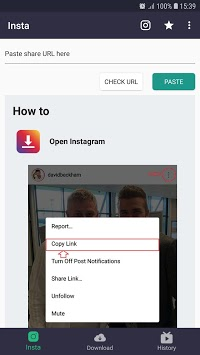 By copying image's and video's link and pasting into Downloader for Instagram app which automatically downloads that video/image, then you can save into your device, repost on INSTAGRAM, share FACEBOOK, TWITTER and other social networks. - Downloader for Instagram allows you to easily download videos and photos very quickly from Instagram with HD quality & 4k. - Easily download videos directly from the Instagram to your device. All formats are supported. The video downloader automatically detects the video, which you can download with just one click. - Support downloading multiple files at once and arranging scientifically. - Video Downloader for Instagram is best Video downloader without any hustle and with simple steps of clicking and download its best video downloader for android. Install now it’s a fast video downloader. Must try now & download video from Instagram android. - You can watch live videos and easily share videos to friends. - Select videos or images which you want to download. - Click three dots icon of post's top right corner and click Copy Share URL or Copy Link option. - Press "DOWNLOAD" to download video or photo. - Press "SHARE LINK" to sharen link download with your friends. - Download videos or photos without login required. - Save multiple photos and videos.